It has over 700 lb-ft of torque! When Audi unveiled the first ever SQ7, we fell in love. This magnificent SUV comes with a 4.0-liter tri-turbo V8 with 435 hp and 664 ft-lb of torque. And because it's a diesel, it can get over 30 mpg. Unfortunately, because of Dieselgate, the SQ7 may never be offered in the US. 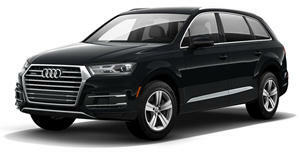 The best we can hope for is that Audi will offer a gas-engine version for the US like it did with the SQ5. It is rotten luck that the US may never get the diesel SQ7, because the new ABT Sportsline version is an impressive tuning option which proves how amazing diesel can be. ABT has tuned the SQ7's engine to produce 520 hp and 715 lb-ft of torque. That's 20 hp more and only 13 lb-ft of torque less than Audi's insane V12-powered Q7 from several years ago. The tuned SQ7 can hit 62 mph in just 4.6 seconds, shaving about 0.2 seconds off the stock time. ABT didn't just stop at making the SUV faster, it made it sound better as well. Thanks to a package called "ABT Sound Control" the SQ7 will transform from a "soft diesel" to a "sonorous racer." The tuning company has also fiddled with the suspension, adding level-control which can lower the vehicle by around 20 mm. At cruising speed, the car will go back to normal ride height to preserve comfort. Don't just take ABT's word on how good the SQ7 can sound. The company has included a brief video which shows how at the push of a button, the SUV can go from quiet mom-mobile to snarling race car.